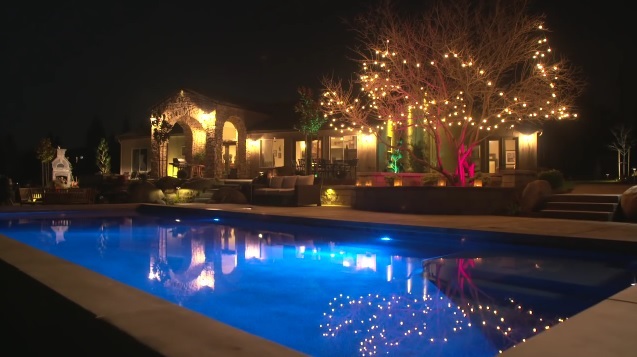 Color changing LED landscape lighting systems have been around for awhile. It’s a fact. But up to now, they have been reserved for those elite low-voltage systems covering sprawling landscapes that the average Joe could only dream of having. The existing systems are incredible – they create lighting zones that can each be colored by any combination of the spectrum. The only downside has been the price tag associated with them. Enter the RGB: The Unique Vivid Series color changing MR16 LED bulb. This is the first ever drop-in LED bulb to enter the market and we are all kinds of starry eyed. What does drop-in mean? It means you can simply remove the existing bulb (halogen or LED) from your current landscape lighting fixture and insert the new Vivid bulb to turn your boring system into a kaleidoscope. It’s that easy. But the developers over at Unique didn’t stop there. They went one step further and Bluetooth enabled it. Each bulb has its own Bluetooth chip and can be controlled via SmartPhone. Upon bulb installation, you can set up your system with the Vivid App and get to work accessing a spectrum of 30,000 color possibilities – for EACH fixture. That’s right. Each fixture can be colored individually with a lamp control screen. It’s wizardry. If wild color isn’t your thing, they make the same bulb with a spectrum of white color. This is a great tool for finding the right color temperature for different types of architecture. White or gray houses look incredible with a 3000 Kelvin temperature while blue buildings are brought to life with the coolness of a 2700 Kelvin temperature. The Vivid Series CCT bulb allows you to move between the ranges of white color temperature (even up to 6500 Kelvin) with the touch of a button. Other features of these bulbs include a 25,000 hour lamp life (that’s 8 1/2 years if you run your landscape lighting system 8 hours a day, 7 days a week) and a five year warranty. They currently come in a 5-watt, 40-degree spread bulb which is conveniently dimmable. Pricing is appropriate, too. The RGB bulb will cost you about $100 per bulb, while the CCT version retails for $65. We love it when a new product changes the game and shakes things up. If you’re interested in coloring your landscape give Total Sprinkler & Lighting a call. We would be happy to introduce you to a world of lighting possibility.